Micromeritics 3Flex Surface Characterization Analyzer is a fully automated, three-station instrument capable of high-performance physisorption, mesopore, micropore, and chemisorption analyses with superior accuracy, resolution, and data reduction. Each analysis station is upgradeable from mesopore to micropore with the option of designating one station for chemisorption analyses. All analysis stations can be configured for krypton analysis of low surface area materials. Vapor sorption capability is standard. A single 3Flex with its minimal footprint and three configurable analysis stations eliminates costly investment in multiple instruments and additional bench space. 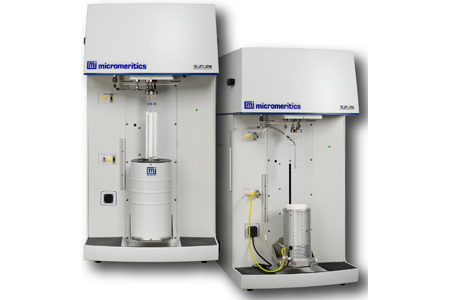 The 3Flex is ideally suited for the characterization of MOFs, zeolites, activated carbons, adsorbents, and a wide variety of porous and non-porous materials. The 3Flex also includes enhanced software capabilities, data reduction features, and instrument monitoring. A new advanced dosing method allows the user to mix both pressure and volume increments. An innovative dashboard monitors and provides convenient access to real-time instrument performance indicators and maintenance scheduling information. Utilizing interactive click-and-drag calculation bars, innovative MicroActive for 3Flex software gives the user the ability to quickly fit a model to isotherm data, reducing the time required to obtain surface area, porosity, and chemisorption results. It is not necessary to generate reports to view results – see it graphically and interactively on the screen. User selectable data ranges through the graphic interface allow direct modeling for BET surface area, BJH pore volume, t-plot, Langmuir, DFT interpretation, and much more. The isotherm analysis suite provides an extensive selection of NLDFT models for calculating pore size distributions. Chemisorption calculations include dispersion, metal surface area, and crystallite size. Unified Analysis Conditions for physical and chemical analyses allow users to rapidly develop new methods with a common interface.